As Dave Chappelle reflects on spending 30 years in comedy, he says he’s grateful and humble to still be living his dreams onstage. “In all honesty, I mostly feel grateful that I survived it, and that I'm able to still do it, and that I have the respect of my peers,” the 43-year-old said in an interview Friday night following a show at Radio City Music Hall, where he was joined by The Roots, Dead Prez and T.I. Chappelle’s residency at the venue in New York kicked off this week, and included guest performers such as Lil Wayne, Usher, Ice Cube and others. Saturday and Sunday's shows were to feature Chris Rock, while Trevor Noah, John Mayer, Lauryn Hill, Leslie Jones, Chance the Rapper, Solange, Childish Gambino, Erykah Badu and more were scheduled for upcoming performances. 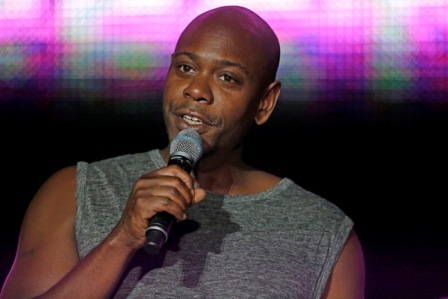 Chappelle — who received some criticism about his jokes about transgender men and women during the new shows and on his Netflix special — talks about his residency, sensitive jokes and more in an interview with The Associated Press. AP: How does it feel to celebrate 30 years in comedy? Chappelle: What’s funny about it is my son, my youngest son, is as old now as I was when I started (at 14), and looking at him makes me understand how crazy that was to start at that age, even though at the time it felt very natural. ... People general like me — they’re always going to be people that don’t like me — but it doesn’t matter, enough people like me that I can make a living this way. After I left my television show, I didn’t know that I would ever, I didn’t think anything, that was a real tough lump I took. I can’t explain to people what the emotional content of those decisions were like. And what’s beautiful about it is, a guy will go through something sometimes in show business and the people will get away from him. Certain people, especially people like Ahmir (Questlove) and The Roots and all these other guys, they’re always still included and it was always a little more familiar, and it meant a lot to me. Even a guy like Usher, I remember Usher one time, I was at a bar and he brought me out to a birthday party another celebrity was having; it was just nice to be included without having to be hot. It was just warm. These types of memories I’m grateful for and I’m old enough to understand to be grateful for (it). I don’t take any of this (stuff) for granted, none of it. So there’s a lot of, being a public person, that I personally find terrifying, and I don’t really get locked into an existence of being hot or not, but night’s like tonight, it’s a breath of fresh air. Just to see that everyone’s OK; Jay-Z’s making a record and he’s damn near 50 and it’s relevant. And we’re all working. AP: I haven’t been to a show before where they’ve locked up your phone. Chappelle: There’s no phones or anything. If there were phones and people were posting stuff, you could get likes and maybe get followers, but if no one has a phone, that’s how you become a legend. ... Comedy relies on the element of surprise and any part of a show taken out of the context of the show could sound — well it all sounds crazy anyway — it would sound way crazier. And it empowers me to be more courageous with the audience ... which is all I’m really concerned with ‘cause they came out. AP: The world is very sensitive right now, and I’m wondering if you take that into consideration when you’re writing jokes. Are you altering jokes to satisfy people? Chappelle: This is a hard question to answer. No, it doesn’t alter it. I feel like our ears are calibrated a certain way for a reason right now, and different people are sensitive to different things. I think the only way we got a shot at being cohesive and hearing each other is if we speak more freely. And I feel like there are things happening in culture that are making the audience a more discerning audience out of necessity. Mainly the fact that we’re so bombarded with so much information that we have to be more sophisticated to sift through it all. If you have presidents just dismissing things like, ‘That’s just fake news’ — Jesus Christ, it’s really serious out here. So people have to learn how to critically think and they also have to learn how to objectively listen, and that’s hard. And then there’s these phrases they got now, what do they call it? Identity politics. But (stuff) is what it is. And the core of it from my perspective is everybody’s trying to be happy and feel good and get through what seems to be an increasingly difficult life. Not difficult like we’re lifting heavy things, we don’t lift heavy (stuff), we don’t do that anymore, but all our heavy lifting is psychological, emotional, and there are some things that are happening that I look at as encouraging that the conversation will elevate. We’ll become a more soulful nation. AP: You don’t do lots of interviews, so what is it that you want to say to people out there? Chappelle: I always get nervous addressing people outside the context of jokes, but I do feel grateful. Not just because people come out (to see my shows), but there's a certain way people engage with me, it makes me feel like there’s an acknowledgment that I’m a person. And they don’t expect me to be perfect, which is a relief because I am not. It’s a real valuable relationship ... and I know everything I say is not for everybody. When I’m right, I’m right, and when I’m wrong, forgive me. And again, it’s not church — if you want to hear somebody be right all the time go to church, if you want to laugh at (stuff) that terrifies you, go to a comedy club. And that’s how I feel.